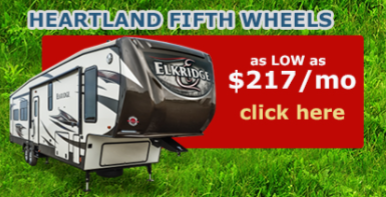 Heartland RV Week Sales Event- August 22-26 - Huge Savings! Here at Wilkins RV, we have the best selection of Heartland RVs around. 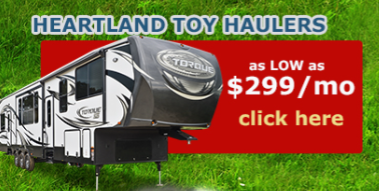 With a large number of Heartland fifth wheel, travel trailer and toy hauler brands available, you are sure to find just the right RV to suit your travel needs perfectly. Now is your chance to get an amazing deal on your RV home away from home at our Heartland RV Week Sales Event. With a limited time manufacturer’s rebate offer of up to $4000 on select Heartland RVs, you can get an amazing RV at a price you can afford. This manufacturer’s sponsored sales event runs for 5 days only, between August 22nd-26th, so don’t wait! Heartland factory representatives will be onsite to answer all your questions as well as offer useful product insight. Heartland RV products rise above the competition due to their cutting edge innovations, value driven pricing, residential style interior design and quality construction. 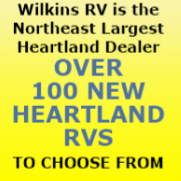 Wilkins RV is the Northeast’s largest Heartland dealer with Over 100 New Heartland RVs On Sale to choose from! Take advantage of the best prices of the year on our entire Heartland RV line of products. With a wide variety of floorplans to choose from, you are sure to find the perfect RV to make your outdoor adventure dreams come true. 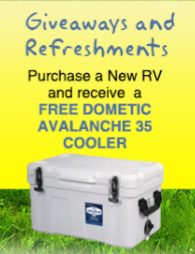 As an extra bonus, when you purchase a new RV during our Heartland RV Week Sales Event, you will receive a Free Dometic Avalanche 35 Cooler! Contact Us at our Wilkins RV locations in Bath, Churchville, Syracuse or Victor, NY. Don’t miss out on your chance to take advantage of these amazing, once a year manufacturer savings on a top quality Heartland RV camper this week only from August 22nd- 26th!